© Temple Sounds 2006 - 2015. All of our bowls are hand picked in Katmandu Nepal and are 1st in sound quality. There are two sound qualities available, most other venders stock 2nd quality which is inferior sound-wise to 1st quality bowls. Our prices are the best in the US for 1st quality, hand made bowls. There are none better sound-wise to be found anywhere. These tiny silver finish bowls are both very easy to play and are characterized by a full sound in contrast to their diminutive size. They are excellent for the higher chakras as well as for clearing the aura. Convenient to carry around and with a clear bright sound. All sets and singles come with 1 mallet. Ring cushions and Pillows for your bowls are available on our ACCESSORIES Page. 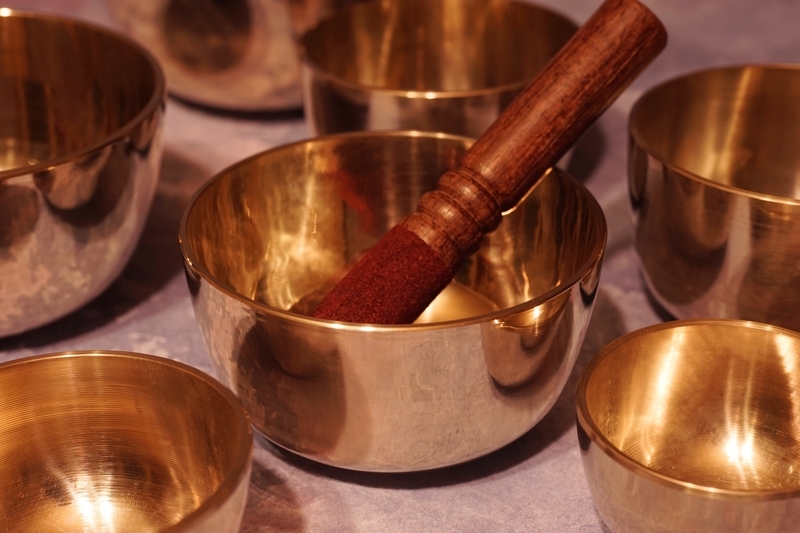 Buddha & Tara Tibetan Meditation Singing Bowls (4.5 inch) are both beautiful sounding and relaxing to play modern singing bowls with Buddha motifs and Tara goddess energy. those just starting out with Tibetan Singing Bowls. 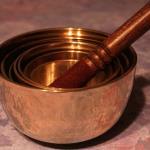 Excellent 5th/2nd Chakra modern bowl, hand hammered bronze w/sacred designs and golden patina. Wonderful projecting sound. 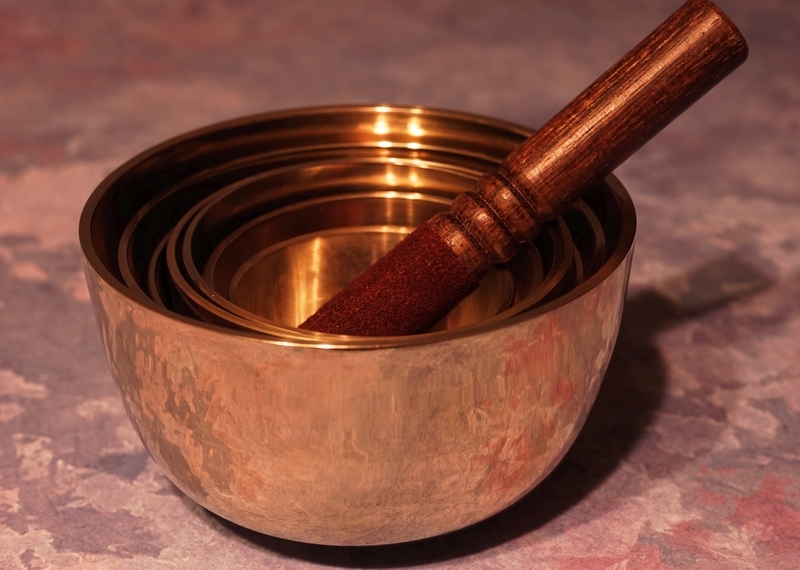 Excellent 7th/2nd Chakra modern bowl, hand hammered bronze w/sacred designs and golden patina. Wonderful projecting sound. Excellent 3rd/7th Chakra modern bowl, hand hammered bronze w/sacred designs. Great projecting 432 hz sound and nice wood & leather mallet spin w/very clear harmonic. Very easy to play! 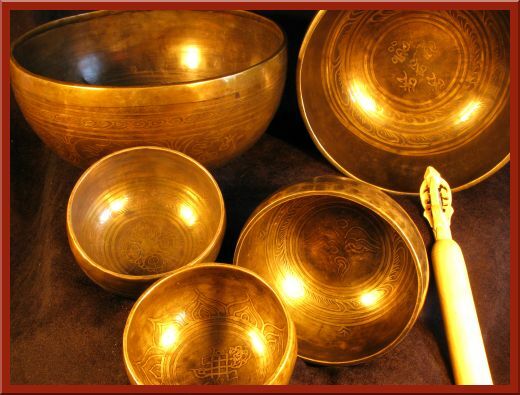 This very large set of Modern bowls consists of 22 (3.75" to 7") hand hammered bronze bowls going chromatically low to high from notes B to G# and 10 silver toned metal high pitched bowls from A to G# at the highest in chromatic order. All bowls play easily and have beautiful long tones and they will also nest together for easy portability. This is the largest matched bowl set of this size we have available and all the Chakra tones are represented here as well as the Pentatonic notes. This set is perfect for someone who wants a huge set, with easy portability. This is a wonderful set for meditation, healing, and chakra work and all other orchestral and musical applications. Sizes: 2.75", 3.25", 3.5", 3.75", 4", 4.5", 5.25". All 7 bowls nest together for a very portable 5lb 13oz set. Every bowl in this set is carefully matched by Emile de Leon at Temple Sounds so there are no incongruities between the tones. Bowl tones in your personal set may vary from the ones shown in this demonstration video as every set is unique. 7 Bowl Set includes 1 mallet. Cushions are not included. 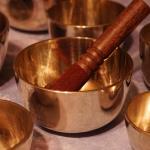 Excellent 6th & 3rd Chakra modern bowl, hand hammered bronze w/sacred designs close to perfect pitch in the harmonic. Relaxing and good projecting sound with all mallet types! All bowls incredibly easy to play! Scale sequence going from Low to High (C to B) for all 7 Chakras Healing and adjustment. You don't see true Crystal Seven Bowl Chakra Sets too often...of this Sonic quality! Beautiful Modern bronze hand hammered bowl with 3rd & 6th Spiritual Chakra energy and artisan sacred etchings. Great for Aura cleansing!